The Olympic movement has come a long way since its origins in 776BC. The games of old were dedicated to the Olympian gods and were staged at the ancient site of Olympia in the western Peloponnese. Events such as running, wrestling, boxing, the pentathlon and equestrian competitions took place. Let Sunvil transport you back to the Olympiad of old on our 7-night fly-drive. Direct flight to Athens. On arrival at Athens airport, you will be transferred to your hotel. The Philippos is the 3 star sister hotel to the 4 star Herodion just over the road. Sunvil has used both for over 30 years and they represent very well located, low-key hotels which have always suited our clientele. The hotel is located in the heart of the historic centre of Athens, just moments from the Acropolis and Plaka district. Overnight at the Philippos Hotel in Athens. Day at leisure in Athens, one of the world's treasure-houses. There are so many sites of interest to visit in Athens that even the longest stay is never enough. We highly recommend the Acropolis Museum; the ancient site of the Acropolis crowned by the Parthenon; the Temple of Zeus; the National Archaeological Museum and the Plaka neighbourhood. You should also allow time to visit the modern Olympic Stadium which is the finishing point of the original marathon in 1896. After breakfast, your car will be delivered to the Philippos Hotel. The drive today will take you to the ancient site of Delphi, one of the venues of the Panhellenic Games of which the Olympics were part. The drive will take c.2 1/2 hours. 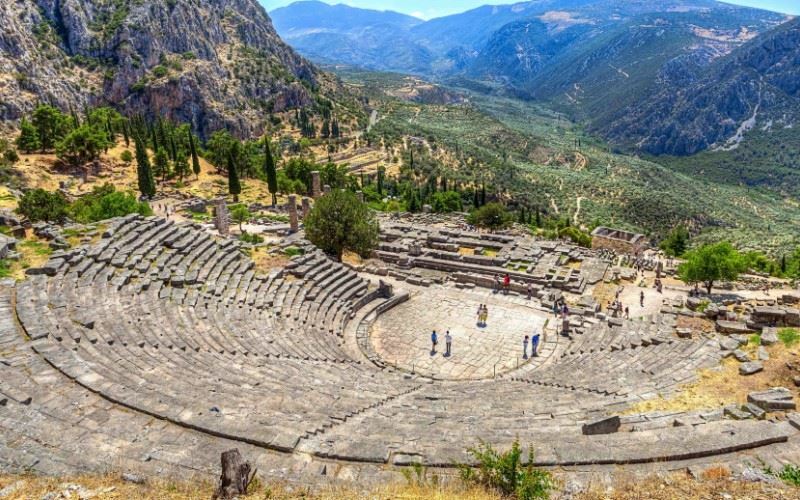 In Delphi, take time to visit the archaeological sites which include the Sanctuary of Apollo and a well-preserved amphitheatre. Overnight at the Acropole Hotel in Delphi. Today, your journey will take you over the Rio bridge to the historical site of Olympia. The drive will take c.3 1/2 hours. Olympia is the most celebrated Sanctuary of Ancient Greece and, as its names suggests, the birthplace of the Olympics. Visitors here can explore the ruins of the stadium. There is also a museum dedicated to the Olympic Games as well as one to the archaeological finds of the area. Overnight at the Europa Hotel in Olympia. After breakfast drive east towards Nafplion, the first capital of modern Greece. Nafplion is one of the best-preserved and most beautiful towns in Greece. The Venetian architecture, narrow lanes and the hilltop fortifications are the perfect setting for a late afternoon stroll. Overnight at the Latini Hotel, Tolon & Nafplion. Relax in one of the many cafés located in the old town square and or along the seafront, or head to ancient Nemea (one of the four sites of the historic Panhellenic Games), Epidavros Theatre or Ancient Mycenae. You can do all three in one day, distances are not great. Overnight at Latini Hotel, Tolon & Nafplion. Self transfer to Athens (c.2 hours drive) for your return flight to the UK. The Philippos is the 3 star sister hotel to the 4 star Herodion just over the road. Sunvil has used both for over 30 years and they represent very well located, low-key hotels which have always suited our clientele. The Philippos is located in Mitseon Street, 250 metres from the Acropolis Museum and Acropolis subway station and 450 metres from the pedestrian area of the Acropolis. Plaka is a 10 minute walk. It is ideally located and a firm favourite with many of our clients. The decor is bright and furnishings functional and comfortable. 48 air-conditioned rooms including standard (twin or double), deluxe (twin), triple and family rooms. All rooms have bathroom with bathtub and shower, hairdryer, free WiFi, satellite/cable TV, direct dial telephone, fridge, mini-safe and balcony with city or Acropolis view. Family rooms can accommodate two adults and two children. The Hotel is located in the heart of La Paz, a short distance from the main street of La Paz. The Hotel is located in the heart of La Paz, a short distance from the main street of La Paz. There are plenty of good restaurants around and the archaeological museum is right next door. There are three restaurants and a piano bar within the hotel as well as a fitness centre, spa and swimming pool. There is internet access in the lobby as well as in the rooms and the 110 rooms are modern and spacious. The hotel boasts some fantastic views from the highest roof garden in the city at the 'El Solar' restaurant.